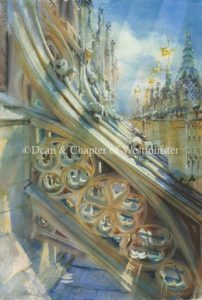 So writes the Dean of Westminster, the Very Reverend Dr John Hall in his introduction to the catalogue of my exhibition now showing in Westminster Abbey. As I looked around the display in the evening light, just minutes before the opening ceremony with the works all finished, installed and lit in this magnificent setting, the achievement of the collection began to dawn on me. I had never seen all these paintings together before, a broad display of complex watercolours inspired by a monumental subject. The exhibition is on until 16th May and I am thrilled that all these paintings have been acquired by the Abbey Collection and will therefore remain as a record of the Abbey in history. Please visit the show and take time to discover the Abbey. 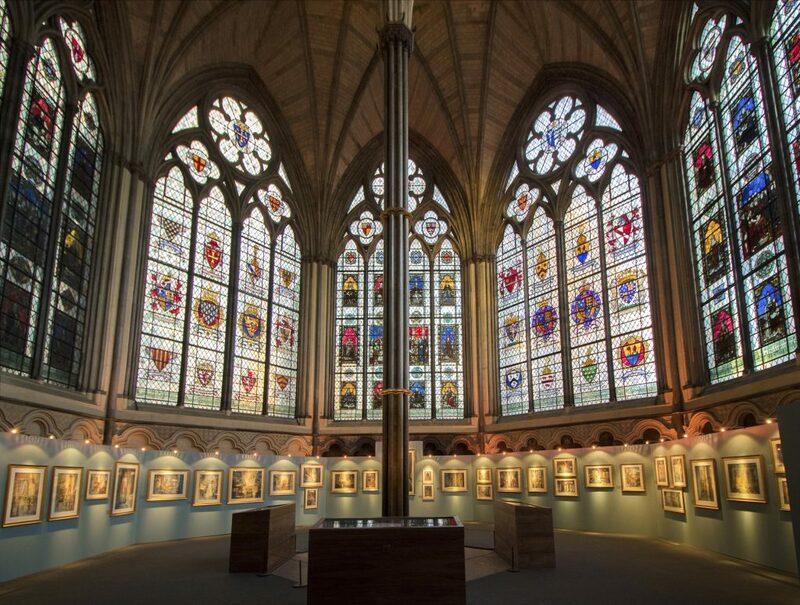 The exhibition is in the Chapter House (above), originally the 13th century meeting hall of the Benedictine order and later the seat of the King’s Great Council and the Commons, the foundation of England’s first parliament. Today the vaulted ceiling, which is supported on a single slender column, hovers far above with sunlight streaming in through the heraldic stained glass. My display of watercolours is humbled in this majestic context, but the subjects depicted are able to stand up for themselves. 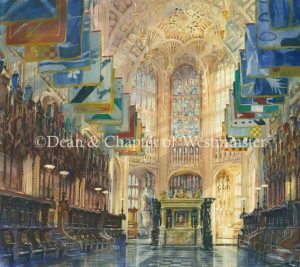 The paintings offer a visual tour of the entire Abbey, beginning with the marriage service of the Duke & Duchess of Cambridge at one end and the sunlit Chapter House at the other. Around the central column, display cabinets show a selection of sketches and drawings which explain a little about my working methods. The exhibition leads around the Abbey, starting at the cloister door to the Nave, then along the north aisle eastwards to Statesmen’s Corner, into the intricate Henry VII Lady Chapel. The route then follows the south ambulatory to Poet’s Corner and into the Quire and Nave beyond, much as the visitor to the Abbey might process. At every point a new vista or intimate detail surprises the viewer, rays of sunlight find their way into the shadows to pick out a delicate carving or a noble inscription. Perhaps a long perspective reveals itself and draws the eye into the farthest distance, or a doorway close by opens into a silent chapel. The paintings were done over a six year period during which I was given the great privilege of free access to the Abbey and precincts, to come and go as the light and weather suited me. I even spent an entire night in the Abbey – an extraordinary experience knowing that over 3000 people are buried or commemorated within, a number to be joined this year by Professor Stephen Hawking. Early in my exploration at the Abbey I was daunted by the size, scale & complexity of the place, and early one morning I ventured into the Henry VII Chapel alone. A vivid sunlight electrified the space, the banners of the Knights of the Order of Bath were a kaleidoscope of colour, the intricate fan-vault a crescendo of geometric harmonies and the floor was a shimmer of shining reflections. I was the only person there to witness it and I was thrilled. I immediately embarked on a series of drawings and vibrant colour notes, done sitting on the floor. Together these sketches interpreted the power and the glory of the place, its fragility and the perfection of it. I believed then that I had found a way in. From that day on, I would try to work in the Abbey out of hours and on Sundays when the place regained its serenity. I continued in the Henry VII Chapel before turning to the South Ambulatory and Poets Corner, all enlivened by morning sun. Details and wider views spoke to me in shafts of sunlight: God and nature revealing momentary treasures, all gifts gathered into a sketchbook and smuggled out under my arm! In the light of summer the greater spaces reverberate bright sunlight and the air is shot through with rays of optimism. I aspire to float in space, to soar like a bird, high above it all. Great architecture, art and music enable me to do just that. 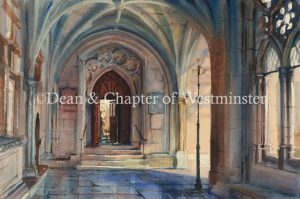 In my early days I chose to paint the safer subjects – the tranquility of the Cloister, sheltering doorways and quiet corners. These gave me the strength to take on the sublimity of the place, and in so doing perhaps better to understand the glory of God. 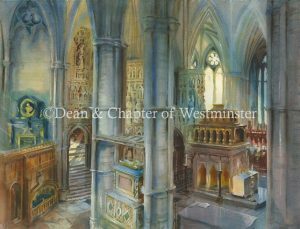 These paintings of Westminster Abbey do not aim to chronicle exactitude. They might not need labels to identify them. A painting should be enjoyed freely as a glimpse of the spirit of the place which the artist had experienced. At first glance my paintings take architecture as their subject. Then they distort it and convert it into a barely-seen theatre of light, which might be exaggerated or even invented. Contrivance of light can be based on truth but is used to describe my sense of the place – the ‘genius loci’. A successful painting relies on a momentary light to illuminate and to give life to the subjects, subjects which are themselves all illusions drawn on paper. Westminster Abbey is extraordinarily complex – a place of worship, theatre of state, resting place of kings and nobles, of statesmen and poets – a memorial to the great and the good. I found that I could best understand the Abbey when it is silent and empty. Alone, every footfall echoes in the stony darkness, the air is filled with whispered prayers and hopes, and with silent colours contrived by eager eyes. Isolated from lights, noise and society, our imagination is free to contradict the known, to seek out the unexplainable, to observe the invisible and to feel the uncomfortable. We can absorb the spirit of the place, the presence of God, the power to free us from those constraints with which we bind ourselves. The Abbey has guided my own response to the monuments and places which commemorate human achievements so powerfully. Over my time working in the Abbey it has become a constant in my life, a ground anchor in the ebb and flow of fortune and the vagaries of exertion and contentment. I am delighted that I have had the privilege of freely undertaking this collection. I have been humbled by the gravitas of tradition safeguarded within the Abbey. I am thrilled to have seen and experienced parts of the Abbey which are accessible only to a few. I am extremely privileged to have witnessed great events of church and state, and to have been nourished by beauty elaborated by the hands of generations of artists and craftsmen to adorn this extraordinary edifice.